ERCIM has played a pioneering role in establishing the Digital Library (DL) field as a distinct area of research in Europe. Instrumental have been, first, the activities of the ERCIM Working Group on Digital Libraries, set up in 1995, and later those of the DELOS Network of Excellence on Digital Libraries. The main objectives of the ERCIM WG on Digital Libraries were to stimulate interest and to encourage collaboration between the ERCIM research teams beginning to be active in this field. A first result was the development of the ERCIM Technical Reference Digital Library (ETRDL) which provided an experimental DL service for ERCIM scientists. An initiative full of future fruitful consequences of the ERCIM WG was the creation of the DELOS Working Group on Digital Libraries funded by the EU ESPRIT Long Term Research Programme under the 4th Framework Programme (1997  1999). The objectives of the DELOS WG were to arouse awareness of priority DL research issues, to encourage collaboration between European research teams, and to establish links with on-going international projects in the DL field. An important achievement was the establishment of a formal collaboration with the US National Science Foundation and the creation of five joint EU-US collaborative Working Groups. These WGs explored DL-related technical, social and economic issues, and published a set of recommendations with respect to DL interoperability, metadata, IPRs and economics, global resource discovery and multilingual information access in a special issue of the International Journal of Digital Libraries. An important spin-off of the DELOS WG activities was the launching of the European Conference on Digital Libraries  ECDL. The annual ECDL conference rapidly became the main forum for the European DL community to present and discuss their research ideas and results. The 13th edition of the conference will be held this year in Corfu, Greece, 27September  02 October 2009. 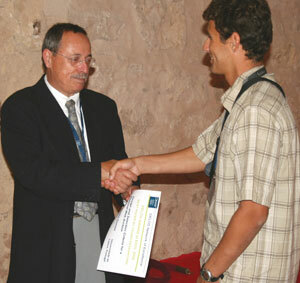 Costantino Thanos presents the 'DELOS award' for the best paper written by a young researcher at the 10th edition of the ECDL conference in Alicante 2006. ECDL - the European Conference on Digital Libraries was a spin-off of the ERCIM DELOS Working Group. This year, the 13th edition of the conference will be in Corfu, Greece, from 27 September to 2 October 2009. In 2000, the DELOS WG gave way to the DELOS Thematic Network of Excellence on Digital Libraries, funded by the EU under FP5 (2000  2003). The activities of the Network included the organization of workshops, summer schools, important evaluation initiatives (CLEF, INEX), and technology transfer actions. In addition seven DELOS  NSF joint WGs were created: DL Infrastructures; Digital Imaging for Cultural and Historical Materials; Digital Archiving and Preservation; Personalization and Recommender Systems; Actors in DLs; Spoken-word Digital Audio Collections; and Emerging Language Technologies and Rediscovery of the Past. In a Roadmap Report the DELOS research community defined the DL Grand Vision: Digital Libraries should enable any citizen to access all human knowledge any time and anywhere, in a friendly, multimodal, efficient and effective way, by overcoming barriers of distance, language, and culture and by using multiple Internet-connected devices. The last phase of the DELOS evolution was its transformation into the DELOS Network of Excellence, under FP6 (2004  2007). The mission was to integrate and coordinate the on-going research activities of the major European research teams in the field of Digital Libraries. The main achievement was the definition of the DELOS DL Reference Model, a formal and conceptual framework describing the characteristics of Digital Library Management Systems and the development of a Reference Architecture for such systems. At the research level, a newly funded EU project, DL.org, aims to further develop and consolidate the DELOS DL Reference Model with the ultimate goal of making it an internationally accepted standard. At the development level, DELOS has inspired many EU projects aiming at developing scientific repositories and Digital Library infrastructures (Scholnet, Cyclades, Diligent, D4Science). At the educational level, the DELOS DL Reference Model is taught in several European DL university courses. In addition, significant expertise created under DELOS has been canalized into "Europeana", the major effort of the European Commission towards the building of the European Digital Library. The main merits of DELOS, with the help and support of ERCIM, are to have significantly contributed to the creation of a European DL research community, to have contributed to create important durable scientific events and infrastructures (ECDL, CLEF) and to have anticipated, in the form of either prototypes or roadmap reports, many actions of the European Commission in the field of Digital Libraries.